Summer Screen Printing Course Dates. 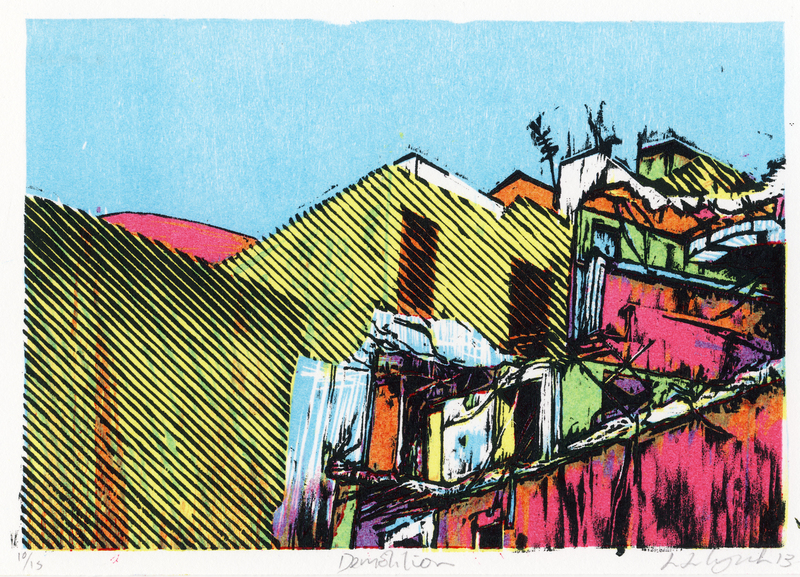 Please click here for more information about the summer screenprinting courses I will be Running this summer at The Island Art Space in Bristol. Finally I’ve got round to posting some of the lovely photo’s of my new woodcut prints onto the blog, these where created this year and will be exhibited at Spike Print Open and New Mills Arts weekend in May.More postings to come in regards to more exhibitions coming up. Also I’ll be running a summer season of screen printing workshops from June- August at the Island Art Space so, If you fancy learning a range of screen printing skills get in touch (via the contacts tab on my home page). In the mean time please enjoy these lovely documentations of my work. Photos Taken By Jo Hounsome Photography. Please Click on the image to be taken to the Gallery. Spike Print Blog Post About The New Show. My new exhibition opened last night at Spike Print Studio. It was a really lovely a great evening. Thanks to everyone who came out to see it. 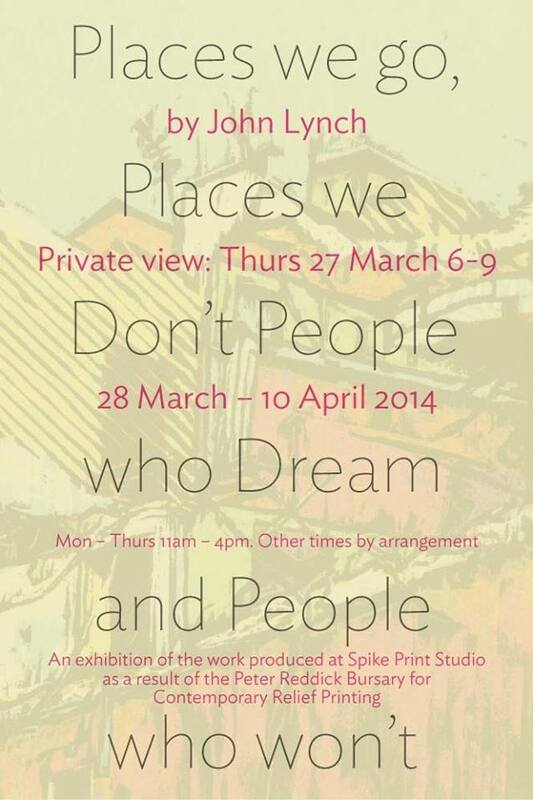 The Show is on at SPS for the next two weeks email spike if you would like to come and see it. I was also invited to do a radio interview on BCFM here is a link to it. Places We Go, Places We Don’t, People Who dream and People Who Won’t. A launch of my new woodcut work produced last year and this year as a result of the Peter Reddick Bursary at Spike Print Studio. Please do come for the private view/party on the 27th March. The Exhibition will be up for two weeks but following the Private View it will be by appointment only. Expect Bright colours! I will then be exhibiting the work through the summer and adding to the collection as I go. Stay in touch to find out more. Please visit the Face book events page and add yourself to the group. This new woodcut print has been made specially for the Cascade Print Exchange organised by Yuji Hiratsuka of Oregon State University. It is only 5″x7″ which is the paper size and that’s about as big as a postcard, and probably contains the most flourescent colours I have used with woodblock printing. It’s another four colour separation which, I’m really enjoying at the moment so it’s quite probable there will be plenty more of these brightly coloured woodcuts on the way soon. For more info on the print exchange and how to take part please email me via the contacts tab. Deadline for the arrival of prints to Cascade is the 31st Jan 2014. A Little Review About The Old Fire Station Pop-up Shop in Oxford. Pop-up Print Shop, The Old Fire Station, Oxford. My Framed Icon Print completed for my final MA show ,Modern Icons, is now up for grabs at the auction to raise money for Syria children fund. This is a great opportunity to buy this rare print (in edition of only 6) and all the money will go to helping support children living in the Syrian crisis. There are also other pieces of work by Bristol artists Emma Caton, Rowdy, Andy Council and many others. The final closing date for the auction is the 5th December. If you can get down to the Farm pub in St Werburgs, Bristol you’ll be able to not only grab a piece of art at a great price but also make a possitive difference to the lives of Children in Syria. Read about me and my work here in the interview I completed for The Print Shop. 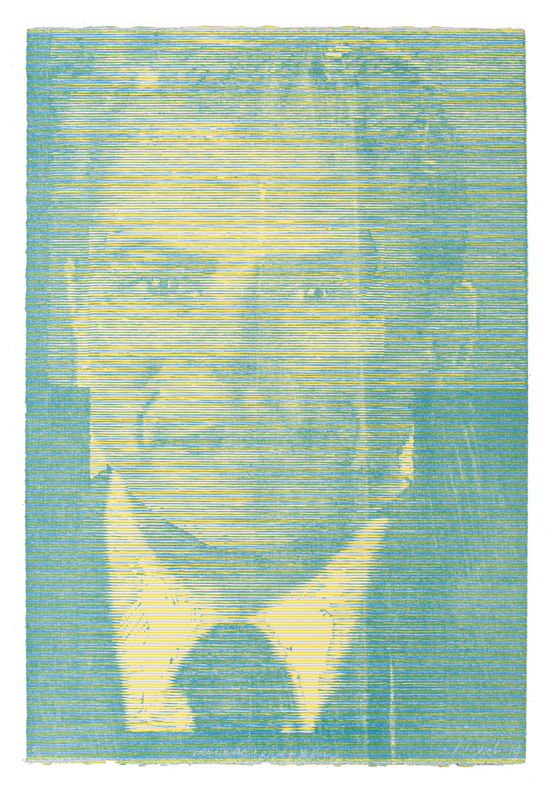 I’ve been developing my woodcut methods whilst under the Peter Reddick Bursary at Spike Print Studio and have recently spent quite a lot of time on Royal Mail:V1 it is a four colour separation woodblock print in which I used four blocks, Black, Yellow, Blue, and Red to create all the colours. I used Kento registration to get really good accuracy. 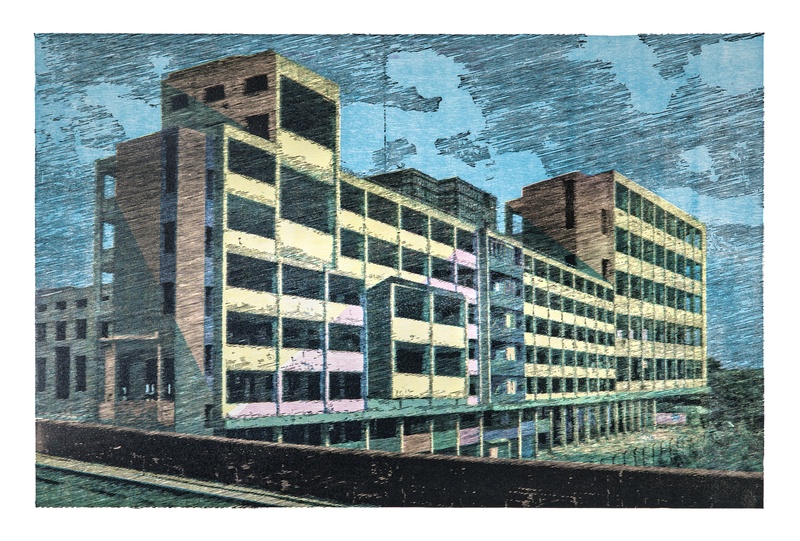 The piece of work is inspired by a postcard of East Berlin from the 1950’s in which a new Utopian dream is offered, However in Royal Mail, the image is offered in similar colours but it shows the concrete skeleton of the former Royal Mail centre behind Temple meads train station in Bristol, The building stands in a perpetual state of limbo and has done since I’ve lived in Bristol. Too much to knock down and Too much to renovate and utterly useless beyond it’s own iconic presence. The Print is a departure from reduction cuts and is the beginning of a new body of woodcut works depicting a kind of poetry in concrete, I’ve given the body the rather tacky title of Concrete Emotions, which a friend of mine told me sounds like a 90s Soft Metal band. I found this rather amusing, Look out for more 4 colour wood block prints from me coming in good time. This print will be for sale in the final volume of The Print Shop in Bristol, so if you’d like to see it up close thats where it is. If you would like to order one please email me at johnjosephlynch@hotmail.com, the print is a very limited edition of 10, and I will be creating some different variation editions. The V1 stands for Version 1. Shotgun Prints, Lynch and Patmore. The Remains of an Elevator. Living Art to open this Friday in Hungerford. novie testi on Hello world!